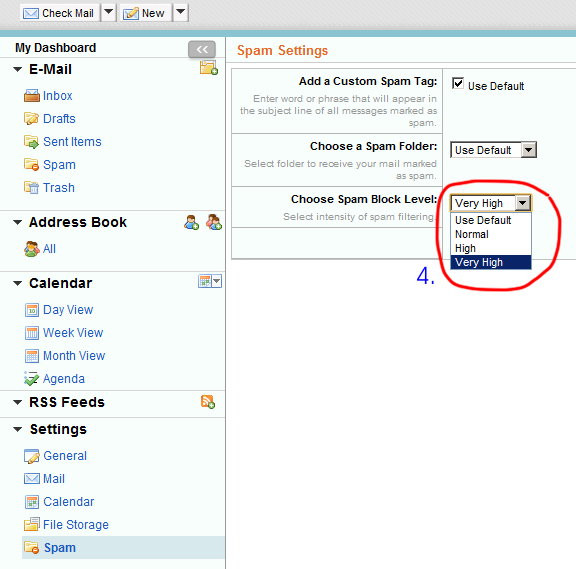 How do I fine-tune my Email SPAM Settings? Bloomland New Email Services platform allows you to have full control over how incoming SPAM is handled through your Inbox. In general, when an email message arrives at Bloomland email servers, Bloomland's SPAM Engine will tag the email message with a SPAM Score to indicate its likelihood of being real SPAM. If this SPAM Score exceeds the threshold defined by either a domain default or user override setting, the email message is Tagged as SPAM, unless, the message's sender's address or email domain is already in your personal "Safe List", and, the email server through which this message was sent is NOT a confirmed Blacklisted server (read more about this in our FAQ), in which case, the message will be delivered to your Inbox. 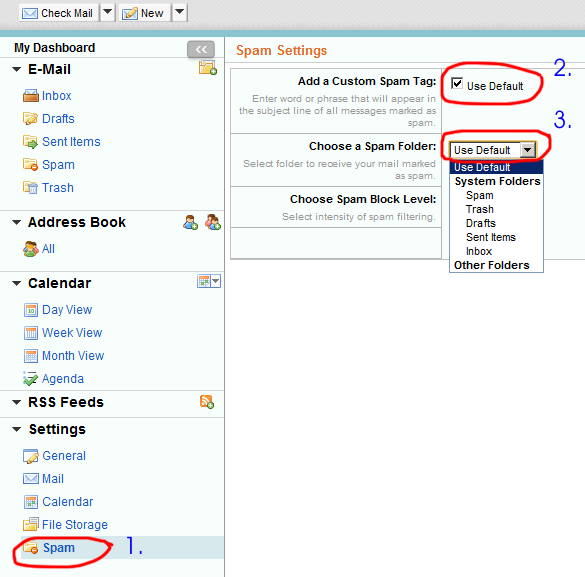 Messages tagged as SPAM will be delivered to the folder specified by the "Choose a Spam Folder" setting (default is the system Spam Folder). Users of POP3 accounts should change this setting to point at your Inbox instead. POP3 can only access the Inbox root folder and NO other subfolders. If you're NOT using the Webmail Interface and want to access other folders and sub-folders in you InBox, you need to set your Email client to use the IMAP protocol instead of POP3. Click here for details on proper settings to use with Bloomland's Email Servers. Email account user has a user definable "SPAM Block Level" setting that controls how aggressive our SPAM Engine will try to identify SPAM. The higher the setting, the more likelihood false positives (legitimate emails incorrectly tagged as SPAM) will occur. There are four level settings: Default, Normal, High and Very High. The "Default" setting will use the user's email domain's default SPAM Block setting which is only available to the domain's Email Administrator. Using a setting other than "Default" will override any default domain setting! In addition, incoming email that has already been Tagged as SPAM by other service providers' SPAM engines will be REJECTED automatically by our SPAM Engine and will NOT be delivered to any Inbox or folders. For example, if an acquaintance tries to send you an email already tagged as SPAM by their Service Provider, such as forwarding already tagged SPAM to you, that acquaintance will receive a "SPAM Rejected" message from our server instead of the message being delivered to your InBox or Spam folder. The following illustrates how you may change your personal SPAM control settings. Please note that you can ONLY change or manage these settings using our Webmail Interface even if you're only using POP3 or IMAP with an Email Client to access your emails. First, login to our Webmail Interface. Please be sure to check the "Standard" user interface option on the Login screen as shown below in Fig. 1. Next, click the "Spam" option under "Settings" as shown below. Here, you can choose whether to add a "Custom SPAM Tag" or Default (which is "***SPAM***") to the Subject line of messages tagged as SPAM. Here, you can choose the folder to redirect SPAM messages to (default is the system "Spam" folder). Here, you can choose the SPAM Block Level for your account.